cementimental - NES bending... work in progress! I found an NES recently at the car boot sale for £2. Thought it might be a prime candidate for video circuit-bending experimentation, and it was!! Here are a few images + clips.... don't really do it justice... more + better images and video will follow, as well as more detailed info.... this is just a quick page... My plan ultimately is to devise some way of randomly/repeatedly triggering the many possible bends to create an automatic visual disruption generator for video projections... possibly sound-triggered in some way??? Instructions Basically, take the thing apart, take a cart apart (I used Super Mario Bros just to be classic), take the top shielding off the NES, wedge the game board securely into it's slot with half of the cartridge casing or whatever comes to hand. 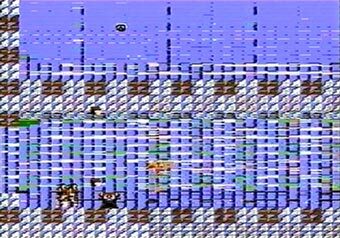 Randomly short out the game ROM's chip legs, see what happens! 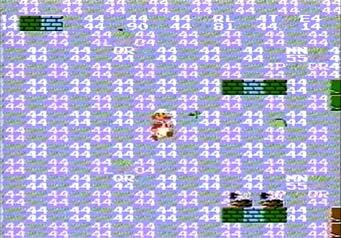 The top right row of legs produces lots of nice visual crashing, other areas make some even more exciting madness, but are more prone to freeze the game.. Please note, I'm using a PAL NES, dunno if American ones are much different, or run off AC or anything, so be careful folks, do this stuff at your own risk!!!!!! (and your NES' risk!) I won't be held responsible! My NES is 9v DC, nice + safe... but check your own stuff!! Here, is Cementimental's mp3.com page, on which the track Nuclear Elf Scandal can be heard. It's kind of lo-fi and minimalist/dull, but it is some semblance of a tune, and it was recorded live using only the NES which ceased to function shortly afterwards! The repetetive rythm was caused by the poor machine repeatedly resetting in a futile attempt to recieve some sensible data! Lots of sprites turning into numbers.... wonder what these mean...? Well, that's all for now.... more soon... these pics really don't do justice to the deranged effect of this in motion...especially if you're trying to play the game. Please email me if you have any questions or comments, or especially if you give this or any other videobending a go. 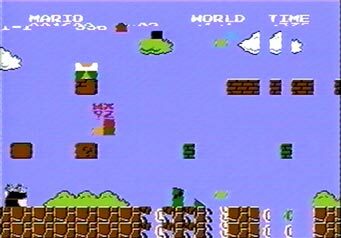 If you want more technical info on the NES, or want to see DIY NES stuff done properly, check out nesdev.parodius.com - tonnes of stuff, most of it way over my head! 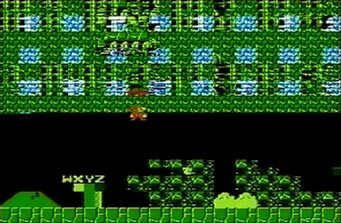 See their "The Sounds of the 2A03" for detailed info on NES sound/music. Need of some money right away but your paycheck is late? Your payday not coming for a while and need cash now? Behind on some bills? Really need a cash advance as soon as possible to get yourself some debt relief? We all know that payday loans can help so why not go to the best in the business? Could you really use a payday advance loan? If you said yes to any of these questions, or you really need a little cash look at what is available at 1800899cash.com, visit today and put your money in the past!